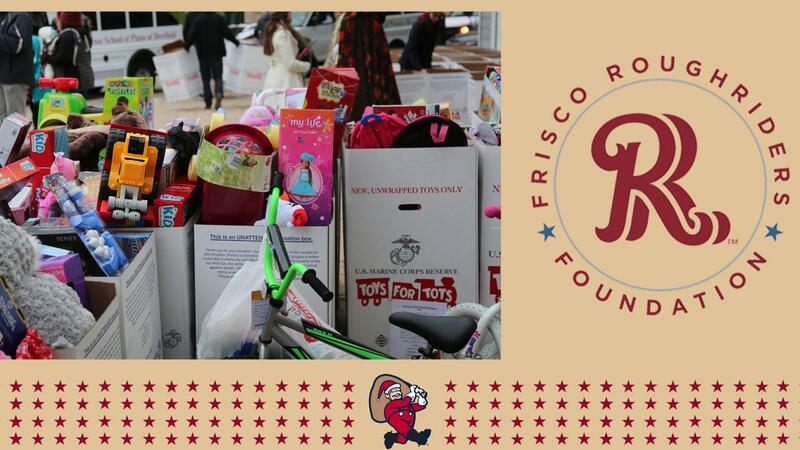 With the holiday season underway, the RoughRiders Foundation continues to be an active supporter of local non-profit organizations in Frisco and surrounding areas. On Friday, December 7, the foundation is hosting its annual toy drive in partnership with Toys For Tots during the RoughRiders Winter Wonderland event. The drive is one of the Foundation's biggest events each year, generating boxes full of toys for kids in need during the holidays. Fans can donate new, unwrapped toys at the home plate gate from 5-10 pm. The event will also include live updates from the ballpark on FOX4. "The holidays are such a great time to give back and we're doing our best to assist in every way we can," said Breon Dennis, Executive Director of the RoughRiders Foundation. "We're especially excited about the toy drive and thank our great fans in advance for their generous donations." In addition to the toy drive, RoughRiders players and staff have been busy spreading holiday cheer the last few weeks by volunteering at local schools, food banks, and animal shelters. The foundation also staged a silent auction on November 27 as part of "Giving Tuesday" to help fund future initiatives with community partners.